Every place has a story. It's these stories that transform locations to a sense of place. The annual NSW Heritage Festival offers a range of history-focused events. This year, the Australian Heritage Festival will be held between 18 April and 19 May 2019. We update this page every year to bring you the latest events. Here are our picks of NSW Heritage Week walking tours. Lying 20km west of Sydney's central business district, Parramatta is Australia's oldest inland European settlement. Founded in 1788, there are many historic buildings. There are three walking events during the Australian Heritage Festival 2019 that sound especially good. This walk takes you past some of the most significant heritage sites from colonial New South Wales – Old Queen’s Wharf, Old Government House, the Parramatta Female Factory, and Aboriginal scar trees (if you're interested in scar trees, here's a canoe tree in Royal National Park). When naturalist Charles Darwin visited Parramatta in 1836 (who knew? ), he commented that “every second house” was a pub. This walk visits 12 of the settlements oldest hotels. But with a 10am kick-off, this tour is more history than drinking. While most have heard of Lake Burley Griffin in Canberra, named after architect Walter Burley Griffin, fewer know of his and his architect wife's vision for the Sydney Harbour suburb of Castlecrag. Learn how Griffin made his houses disappear within the landscape on this two hour walk connecting eight Griffin houses, walkways and reserves. These next two heritage events make it on our list – despite not being walks – simply for our love of Sydney Harbour. A cruising tour of Parramatta River from Darling Harbour to Newington, with a stopover at the Newington Armory Cafe for lunch. The Seven Islands Cruise is a tour of the seven islands west of the Sydney Harbour Bridge. It includes Cockatoo Island, as well as Rodd, Snapper and Spectacle Islands. A rare peek inside the cabin community of Little Garie in Royal National Park. We've visited in previous years – check out our photos of Little Garie. Location: Garie Beach, Royal National Park. Date: Sunday 28 April 2019. Hosted by: RNP Coastal Cabins Protection League. Cost: By donation. Bookings essential. Inside one of the cabins at Little Garie, Royal National Park. Image: Sydney Coast Walks. For sixty years from 1909, the Baulkham Hills Rifle Range trained soldiers for wartime combat. This two hour walk through rugged terrain explores stories from this time and the valley's earlier uses. Date: Sunday 5 May 2019. Sandstone stairs lead to the disused rifle range. Image: Boronia Tours. Haberfield Celebration of Gardens Walk, Haberfield. Sat 27 April. $10. Fantastic Travels of our Parramatta Ancestors (Mays Hill Cemetery). Sun 28 April. $15. A Walk on the South Side, Campbelltown. Sun 28 April. Free. Local History Walk: Making connections in Double Bay, Double Bay. Wed 1 May and Sat 4 May. $10. A Stroll Through St Peter’s Cemetery, Campbelltown. Sat 4 May. Free. Self-guided walking tour of St Thomas’ Cemetery, Enfield. Daily during festival. Free. Haunted Sydney Ghost Tour, The Rocks. Thu, Fri, Sat year-round. $36. 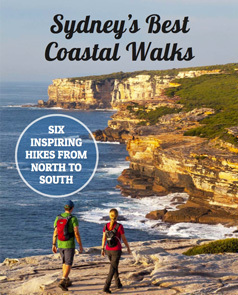 Our range of self-guided walks in Sydney emphasise the area's natural and cultural heritage. Find another Sydney walk to enjoy at your leisure, year-round. If you prefer the camaraderie of a charity event, then pick from our calendar of Sydney walking events, with diary highlights including Coastrek, Oxfam Trailwalker, Bloody Long Walk and more. If you're a history buff, then try these Sydney cemetery walking tours, available year-round either guided or self-guided. Tagged Cabins, History, Walking Events.